Posted on Thu, Apr 21, 2011 : 5:08 p.m.
Eastern Michigan men's basketball coach Rob Murphy was introduced Thursday to staff, supporters and players. He took the stage in a room full of supporters and old colleagues, players he once coached and was about to coach. In the atrium just outside the Eastern Michigan basketball court, Rob Murphy started his head coaching career with a public press conference that felt more like a revival. He became emotional within his first few minutes on the makeshift podium. Family members in the front row yelled encouragement to “take your time.” He looked among the crowd and saw NFL star Antonio Gates, who he coached in high school when he was an assistant at Detroit Central, and Derrick Coleman, who Murphy grew close to as a Syracuse assistant coach. He saw his high school coach at Detroit Mumford, who convinced him as a senior to become a coach. For a minute, Murphy was overwhelmed. As he sat in the second floor of the Eastern Michigan Convocation Center just outside of his new office about two hours after he was introduced, the whirlwind caught up to him again. Rob Murphy's wife, TeNesha, 9-month-old daughter, Ryann, right, and 3-year-old son, Robert, watch Murphy's press conference Thursday at Eastern Michigan. Twenty-five days ago, Murphy applied for a head coaching job at Kent State, where he was an assistant coach from 2002-04. It was his first assistant coaching job after five years as the head basketball coach at Detroit Crockett High. A couple of days after the interview, he pulled his name out of the process and figured he’d be an assistant at Syracuse for his eighth season. Then Eastern Michigan fired Charles Ramsey and Murphy’s wife, TeNesha, told him to apply for the job. It was a head coaching gig in a conference he knew, 45 minutes from the city he grew up in. 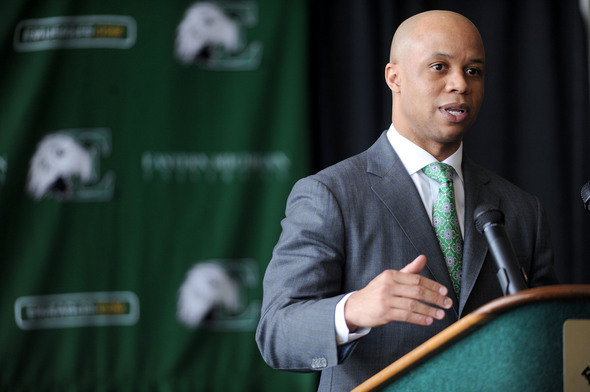 Murphy started as one of 45 to 50 applicants Eastern Michigan athletic director Derrick Gragg and the search firm he hired, DHR International, started with. Eventually, Gragg and the firm had 10 finalists and interviewed eight people over a 24-hour period last weekend between commencement ceremonies. They were also looking for someone with college head coaching experience, something six of the final eight candidates had, Gragg said. When Murphy stepped into his 7:30 a.m. interview Saturday, he thought his chances were slim. Murphy had no idea how he did on his interview, how much his vision impressed EMU President Susan Martin, Gragg and the Board of Regents. He had no idea how guard Derek Thompson, who met with Murphy and all the coaching candidates during their interviews, felt immediately comfortable with him. Murphy’s agent called him a day later and said he was in EMU’s final four candidates and then the final two. He stuck with his Syracuse recruiting duties, heading to Washington, D.C., Baltimore and Philadelphia on Monday. Not wanting to get anyone’s hopes up, he didn’t tell his wife about the call. Figured it was better to wait. Just as he finished for the day in Philadelphia on Monday around 8 p.m., Murphy’s phone rang in his car. “He said ‘I think you’re going to be our guy, but we have to do the background check, and if everything comes back positive, you’re going to be the guy, it’s going to be your job. I can’t tell you that, but you’re our guy, you’re our No. 1 guy, it’s your job.’” Murphy remembered. The conversation shocked him, as he responded to Gragg ‘Really?’ Then he altered his plans. Instead of staying in Philadelphia for the night, he caught the last flight back to Syracuse and spoke to TeNesha. The next day, Gragg called again and officially offered Murphy the job. He accepted and signed his contract, a five-year deal with a salary of $210,000 per year before incentives and a $15,000 per year radio show contract, Wednesday evening. “He’s been preparing his whole life for this position,” Martin said in introducing Murphy. This all led to Thursday, when he shook more hands than he could ever remember, hugged and took pictures with Coleman, Gates and former Syracuse forward Terrence Roberts, who happened to be in town. He heard he had the support of Detroit mayor and NBA legend Dave Bing. Fri, Apr 22, 2011 : 3:58 p.m.
Fri, Apr 22, 2011 : 1:54 p.m.
Coach Murphy has a good coaching pedigree, he will be hungry in his first head coaching stint and he knows how to recruit Detroit. It sounds like an dandy hire for EMU. It's been awhile since Ben Braun's teams were filling the old Bowen Field House. That place used to rock. If Coach Murphy puts a winning team together, you will see the Convo Center rocking, too. As far as the negative commentary from ITH about the Syracuse connection, all I can say is that Coach Murphy just needs to be his own man and do what he knows is the right way. He can be successful with that. Fri, Apr 22, 2011 : 2:47 p.m. I'm with you, Semper Fi. And obviously Derrick Gragg knows a bit more about Syracuse and about Murphy than any of us....and he's working to bring the best to EMU. I like this pick. Fri, Apr 22, 2011 : 1:30 p.m. This is an intriguing development. A Detroit pipeline could bail EMU out of their current situation. Detroit is maybe the only city in the state that is even worse than Ypsilanti, so kids from there would actually be upgrading by moving there instead of taking one look and saying, &quot;Uh, looks great, coach, but I have to look at all of my options.&quot; It would be nice to see EMU have a little bit of success in football and basketball. It's been a long time. Fri, Apr 22, 2011 : 2:44 p.m.
Oh my. I guess that puts Ypsilanti in its &quot;place&quot; eh? Of course readers know that many many cities in Michigan are in worse shape, but that's immaterial. What is material is that EMU had a great basketball program under Ben Braun and can have one again. Slams against the cities of Detroit or Ypsilanti or any other just pit one against another...a regressive move. Most of us choose to move forward. Fri, Apr 22, 2011 : 12:10 p.m.
Time will tell but this is not a good choice for EMU. Syracuse has meddled in Detroit AAU basketball for years and not in a good way. It led to probabtion and Syraacuse was banned from the NCAA tourney. All under the guidance of Jim Boeheim. Not sure EMU vetted this out to see the real Syracuse and the culture Murphy has &quot;learned&quot; in. Fri, Apr 22, 2011 : 11:43 a.m.
Now that is one beautiful family. Fri, Apr 22, 2011 : 1:37 a.m.
Way to go Gragg. Great hire. With the strong local ties to Detroit recruiting should get better. Thu, Apr 21, 2011 : 10:41 p.m. I'm happy. I think my alma mater did good. Thu, Apr 21, 2011 : 10:57 p.m.
Thu, Apr 21, 2011 : 9:44 p.m.
You might want to sharpen your resume, coaches don't last too long around here. Fri, Apr 22, 2011 : 1:57 p.m. If you're not successful, coaches don't last long anywhere. EMU has given it's coaches enough time to prove whether they have it or not. Thu, Apr 21, 2011 : 10:07 p.m.
Well, if he wins he will!! Look what happened under Braun. Thu, Apr 21, 2011 : 9:36 p.m. I hope he enjoys coaching in front the usual 500 fans for the home games. Fri, Apr 22, 2011 : 5:44 p.m.
Don't you think 500 is being a little generous?? Thu, Apr 21, 2011 : 10:06 p.m.
Well who can change that...he can and so can we, eh? Thu, Apr 21, 2011 : 9:34 p.m. I should add, thank you to Ann Arbor.com for this great feel-good story. It's good to read an upbeat EMU article...thanks! Thu, Apr 21, 2011 : 9:31 p.m. Welcome to the Ypsilanti area, Coach Murphy! This is a great sports area, as you know. I know you won't let us down.....and I truly hope as fans we don't let you down either.